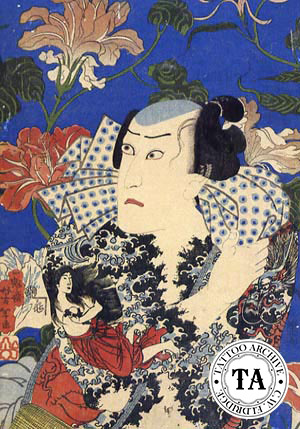 The English translation of the Japanese word ukiyoe is "Pictures of the Floating World". In the 1700s when Tokyo was called Edo, there were many artists who created woodblock prints for theaters, restaurants and teahouses. Like popular artists of any era, they did whatever they could do to make a living with their art. If this included doing portraits of popular actors or beautiful teahouse girls so be it. Many of these woodblock artists did tattoo related prints, which had a big influence on the designs that were tattooed.